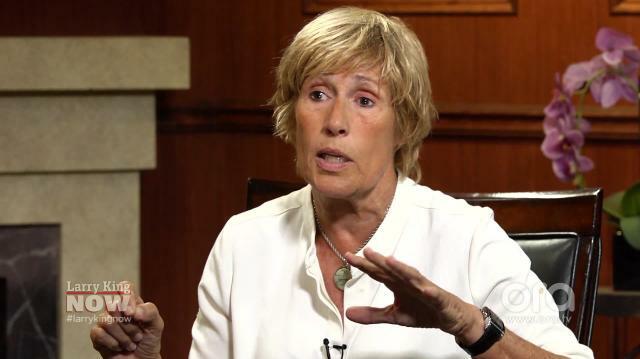 Record-setting long-distance swimmer Diana Nyad shares her coming out story and who she says is to thank for advances in LGBT rights. Plus, the athlete on the molestation she suffered as a child, and learning not to blame herself. Larry King: I guess nothing has revolutionized more in my memory in America than gay rights. It seems like overnight suddenly there's gay marriage is ok. Why did the public change so quickly? Larry King: They don't care. Diana Nyad: They don't care. They're hooked into love is love. They say, "I'm not gay but who's gonna, why should we keep these people from being gay? Come on! Let's open the whole thing up." Larry King: When did you come out? At what age? Diana Nyad: You know, I was 21. But you know, almost every gay person can look back and say in retrospect- and I was in a different era, you know. I had a French mother, she grew up next to Alice Toklas and Gertrude Stein and artists. You know, so to her it was all very, kind of, acceptable and normal. But certainly not in my high school. Nobody was openly gay. Larry King: Where'd you go to school? Diana Nyad: I was in Ft. Lauderdale, Florida. You know, so it was a very non-diverse time. Larry King: I lived there. I lived in Miami. I started in Miami. Twenty years. Larry King: Who did you come out to? Diana Nyad: My mom. I went out to dinner with her. I was in college. I came home from college, I said Mom - we spoke in French - I've wanted to tell you this for a while. And she just right that night said "It doesn't bother me a bit. I love you." Larry King: Did you date men? Diana Nyad: You know, I would never say I dated men. Men tried to come after me. I was always running away from them. I suffered sexual abuse. But we can say at this point, who didn't? As a kid, a coach, a coach who supposedly honored me and loved me and held me up on a pedestal, as I did him. And so there was a whammy there. Diana Nyad: I was 13, 14, 15. You know, terrified, humiliated, silenced. Which I don't like to be. Larry King: Never reported him? Diana Nyad: I did later in life, but the statute of limitations was over. And this guy molested a lot of people. Big long line. Never paid a penny for it. Never spent a day in jail for it. Which is mostly the case. What's the new statistic? One in every four girls, one in every six boys in our society goes through some kind of sexual molestation by the age of 18 by somebody they know. I'm not a rare case. Larry King: Why are victims sometimes blamed? Larry King: "You were wearing, why were you wearing a short skirt?" Diana Nyad: Hey, listen. I sat on a shrink's couch for years and years in my brain, up here in the gray matter, saying it wasn't my fault. I was a child, I was a kid. This was my coach. I adored him. But down in the cellular level, I'm still, I'm pretty together. I'm pretty strong, I'm pretty happy. There's still a little girl in their who's embarrassed and feels it as her fault. What did I do that was so wrong that deserved to be molested like that? Larry King: How often did he do it? Diana Nyad: You know, I'd say we're going on about every three to four months. Whenever he could get a time, like we're driving to a swim meet. "You come in my car, Diana. You know, you're the special one, and the rest of the team will go on the bus." And you know there's a twisted thing that makes you feel you are the special one. You get older and you recognize how wrong it all is.